Uber IPO: Who's getting richer from Uber’s massive IPO? Business News›RISE›Startups›NewsBuzz›Who's getting richer from Uber’s massive IPO? There are dozens of other significant investors who have stakes less than 5%, the cut-off that requires public disclosure. Uber is gearing up for one of the biggest tech IPOs of all time.Its paperwork has been filed with the US Securities and Exchange Commission and made public, giving us a glimpse of its biggest shareholders. These are the people who stand to gain the most if Uber’s entrance as a public company is well received by investors. OWNS 117.5 million shares Uber’s founder CEO Travis Kalanick left the job in 2017, selling a sizeable chunk of his stake to Softbank. But he’s still the single largest individual shareholder. He owns over 117.5 million shares, or about 8.6 of the company. If Uber’s shares command what Lyft is currently trading for, about $60 per share, this stake would be worth over $7 billion. OWNS 82 million shares Garrett Camp is Uber’s original founder. He created an app for hailing black car limo services that his buddy Travis Kalanick loved. Kalanick invested in the fledgling company and later became its second CEO. Camp is the second largest individual shareholder and owns nearly 82 million shares, or about 6%. At $60 per share, that stake would be worth nearly $4.9 billion. OWNS 196,000 shares Dara Khosrowshahi is Uber’s current CEO, hired to navigate the company out of its well-publicised cultural issues and into an IPO. His stake is currently 196,000 shares. OWNS over 222.2 million shares Softbank drove a hard bargain when it picked up a 16% stake in Uber, buying shares from other stockholders at about $33 a share. Softbank Vision Fund, through an entity called SB Cayman 2 Ltd, owns over 222.2 million shares. OWNS 33.2 million shares Ryan Graves joined Uber as employee No 1 by answering a tweet. He was Uber’s first CEO, though Kalanick switched him out of that role and took the job himself. Graves owns 33.2 million shares. OWNS 73 million shares The Saudi Arabia Public Investment Fund invested $3.5 billion in Uber in 2016 and its managing director, Yasir Al Rumayyan, sits on Uber’s board. The PIF is chaired by Prince Mohammed bin Salman. The fund owns nearly 73 million shares or 5.3%. OWNS 105,211 shares Chief Operating Officer Barney Harford, hired by Khosrowshahi, owns 105,211 shares, based on the number of his restricted share units due to convert to shares by the end of May. OWNS nearly 5.4 milion shares Thuan Pham, Uber’s Chief Technology Officer, was hired by Kalanick. Pham was a Vietnam refugee who came to the US under political asylum after a rough childhood in refugee camps. He owns nearly 5.4 milion shares. 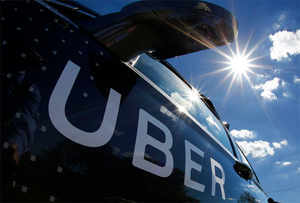 SHARES HELD: Unknown Uber raised $20 billion in its years as a private company and has 162 investors, according to Pitchbook. There are dozens of other significant investors who have stakes less than 5%, the cut-off that requires public disclosure.